﻿Do you need inspiration for faith that's grown weary? Do you question if God has a divine plan for your life? Are you searching for something real to move past obstacles? 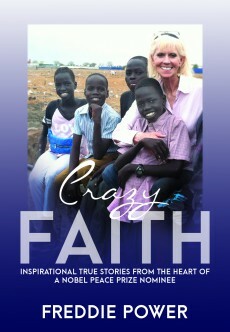 Begin breaking down walls of resistance through "crazy faith." Get rare glimpses into the supernaturally blessed life of a woman dedicated to reaching children and the needy throughout the world. Freddie Power, international missionary and author, shares personal faith stories with warmth and transparency, inspiring you to walk in faith daily to receive God directed miracles and solutions. These true stories will open your eyes to the magnificent ways God moves in response to unquestionable faith in His ability and leading.